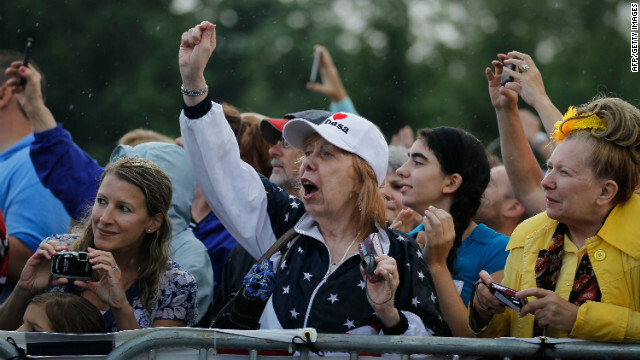 People cheer as Mitt Romney arrives for a campaign stop at Mapleside Farms on June 17, 2012 in Brunswick, Ohio. (CNN) – CNN Contributor Bob Greene says every four years presidential contenders relentlessly court swing state Ohioans. And like traveling salesmen their fervor is intense–until they have made the sale. [1:05] "The candidates become, by necessity, not all that different from the thousands of other sales reps lugging their sample cases across America every workweek." [1:32] "That's how it is every four years during the small sliver of time when the people running for president and vice president can't do enough for the potential voters. It can be flattering– and also a little wearying– to be so relentlessly courted, even while knowing that the courtship has a hard expiration date in November."